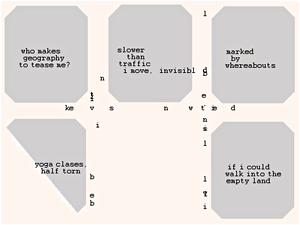 Place squares over other squares and click on them to overlay or combine texts. Create mazes, corrals, funnels, limit the exits, play pinball (pinword?). Click many times on the same square to stack huge amounts of text and release them in a lettristic explosion. And don’t forget how letters are contained, constrained, disciplined into words, lines, sentences, stanzas, paragraphs, pages, windows, books, and screens. Isn’t it nice to set them free, once in a while?